New Delhi's defense spending rose by 5.5 percent to $63.9 billion in 2017 and has now passed France, the Stockholm International Peace Research Institute said in a report released Wednesday. PM Modi has tried to boost domestic defense production with his 'Make in India' program. India has joined the US and China as one of the world's five biggest military spenders, reflecting geopolitical tensions as well as the country's reliance on imported weapons and sprawling personnel costs. Worldwide military spending rose marginally last year to $1.73 trillion, or roughly 2.2 percent of global gross domestic product, the group said. 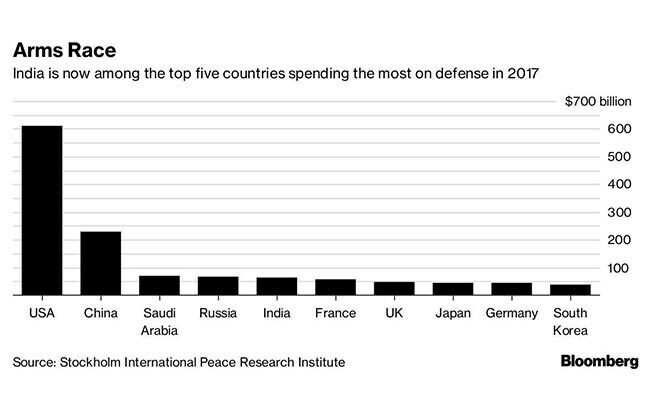 The list of the world's biggest military spenders has remained consistent in recent years, dominated by the U.S. and China, which spent $610 billion and $228 billion respectively, according to SIPRI, which researches global arms spending. New Delhi's defense spending rose by 5.5 percent to $63.9 billion in 2017. However, the group said the balance of military spending is "clearly shifting" toward Asia, Oceania and the Middle East, driven largely by spending increases in China, India and Saudi Arabia. China spends far more on its military than any other power in Asia. Arms procurement from foreign vendors increased slightly. Beijing's share of worldwide military expenditure rose to 13 percent in 2017 from just 5.8 percent in 2008, according to SIPRI. The Chinese government has increased spending 8.5 percent per year between 2007 and 2016 and its leaders "seem committed to increases in defense spending for the foreseeable future, even as China's economic growth slows," according to a U.S. Department of Defense report on China's military. In India's case, however, increased spending doesn't mean the armed forces are deploying state-of-the-art equipment. 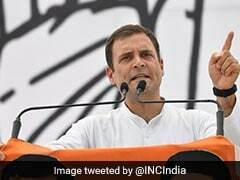 The rise in defense spending mostly goes toward salaries and pensions for roughly 1.4 million serving personnel and more than 2 million veterans, said Laxman Kumar Behera, a research fellow with New Delhi's Institute for Defence Studies and Analyses. 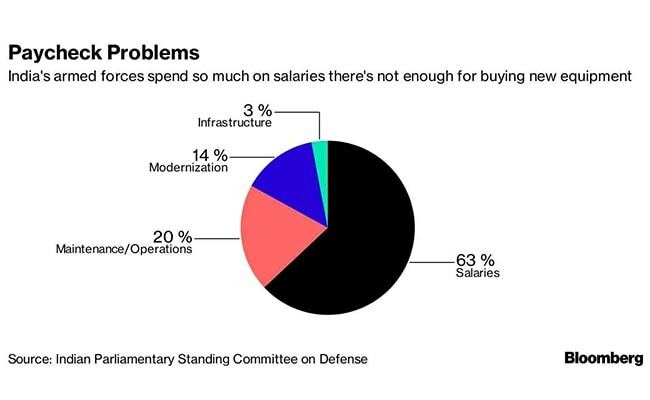 Only 14 percent goes toward military modernization compared to 63 percent for salaries. "Because so much money is consumed by manpower costs, there isn't enough left over to buy equipment," Behera said. India's own army echoes that sentiment. Vice-Chief of Army Staff Lt. Gen. Sarath Chand told a parliamentary committee in March the current budget barely accounts for inflation and tax payments. Only 14 percent goes toward military modernization compared to 63 percent for salaries, Chand said. 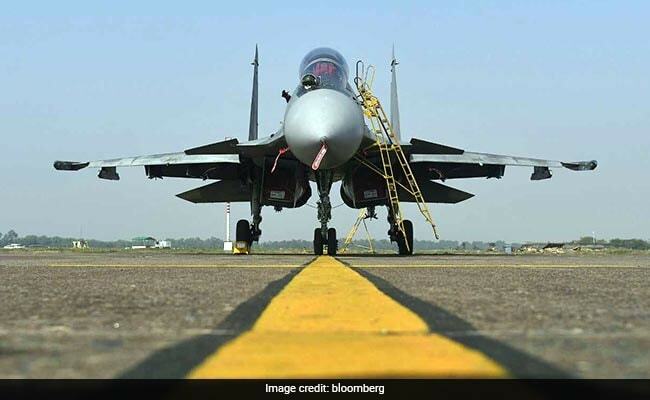 SIPRI previously ranked India as the world's largest arms importer because its domestic defense manufacturing industry remains curtailed by red tape, a reliance on state-owned defense companies and procurement delays. Faced with geopolitical threats from Pakistan and China, Prime Minister Narendra Modi has tried to boost domestic defense production with his 'Make in India' program. 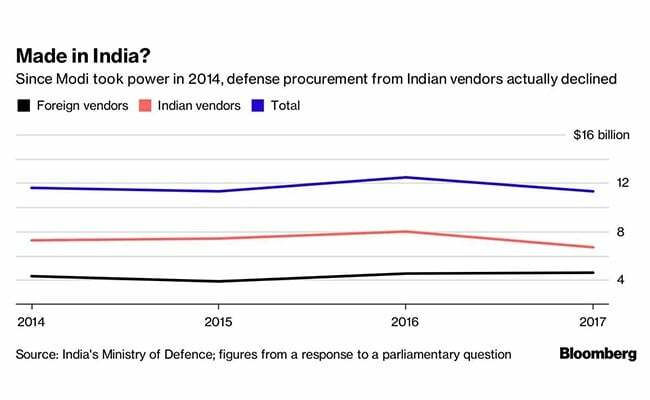 Yet Ministry of Defense data released in response to a parliamentary question show that procurement from Indian vendors has declined since 2014 -- when PM Modi came to power -- while procurement from foreign vendors increased slightly. Overall equipment procurement also dipped, the data show.